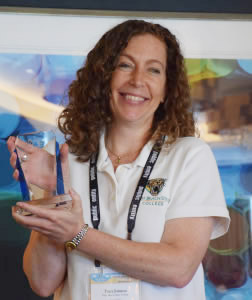 Tracy Joinson, associate professor and coordinator of the Career Center at Palm Beach State College’s Palm Beach Gardens campus, has received the 2016 John T. Brownlee Leadership Award from the Florida Association of Colleges & Employers. Each year, one outstanding FloridaACE member is chosen by a selection committee for the award. The John T. Brownlee Leadership Award was established in 1987 by the FloridaACE in recognition of John T. Brownlee’s contribution and tireless efforts on behalf of the organization. It is the highest honor that a member of FloridaACE can receive and the list of recipients is a “who’s-who” of outstanding career services and human resources professionals who have led the way to make FloridaACE the organization it is today. Joinson served on the FloridaACE board of directors from 2006-16. She spent four years as the member-at-large before serving terms as secretary, vice president, president and past president. Additionally, she was among the first members of FloridaACE to receive the President’s Award when it was established in 2012. To be considered for the award, a member must receive two letters of nomination. Those who nominated Joinson spoke of her commitment and dedication to the association, as well as her efforts to change the name of the association from the Florida Career Professionals Association to the Florida Association of Colleges & Employers. The name change allowed the association to better align with its regional and national associations. The John T. Brownlee Leadership Award was officially presented to Joinson during the FloridaACE annual conference held in June. Yes Ms. Tracy! Proud to have her as my career adviser!